This how to guide will show you how to paint a go kart. 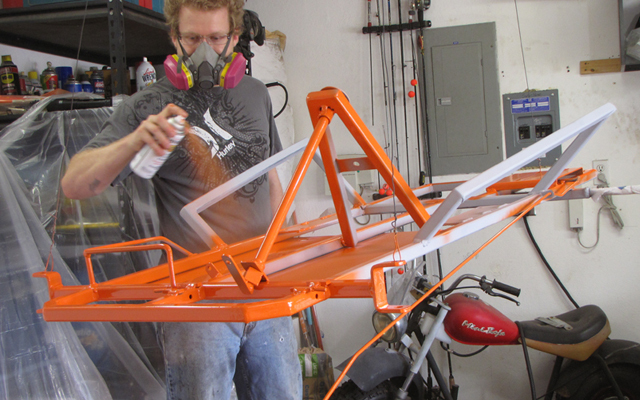 The steps include metal preparation, priming, and spray painting the go kart. Soon you will have some cool ideas for go kart paint designs, and the confidence to complete your go kart paint job for the frame and rims. Secure the wire wheel attachment to your angle grinder. Wire wheel the rust away with your angle grinder. Wipe down all surfaces with mineral spirits prior to painting. Rust removal is easy. Just be careful to not catch the wheel on anything and wear earplugs, gloves and jeans so you don’t accidentally remove some skin or hearing ability in the process. 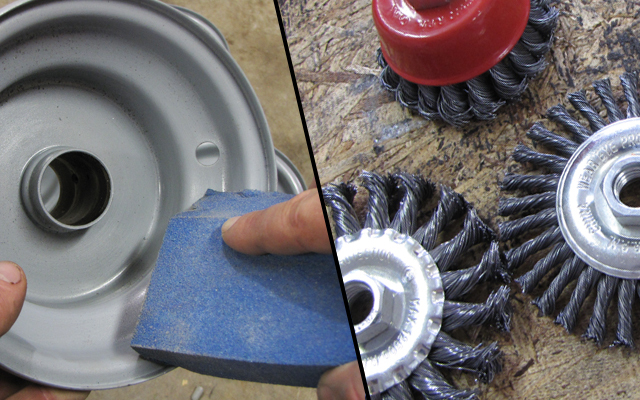 Old Paint: Remove old, chipped paint with a full cable twist or knotted wire wheel attached to your angle grinder. New Paint: Use a foam sanding block (available at any hardware store) with a fine grit to scuff the paint. This abrasion will allow the new coat of primer and paint to adhere to the surface. What Go Kart Spray Paint Do I Need? 2 cans of primer for frame, pedals, and rims. 1 can of black paint for rims, spindles, and pedals. 4 cans of paint for the frame, and rims. A respirator with organic vapor cartridges (optional). Wire to hang the go kart frame (optional). 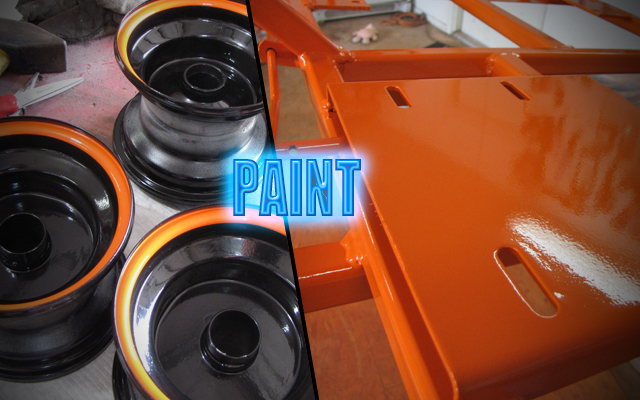 I used Rust-Oleum professional primer to prime the rims and frame prior to painting the go kart. Primer has bonding agents, which will allow it to adhere to the frame better than paint alone. Primer is cheaper than paint. If you prime before painting, the topcoat will go on much smoother with a uniform color, and you will use less top coat. Shake the can for at least 1 minute prior to spraying. Hold the can at the same distance from the workpiece (about 12-16 inches). Move the can back and forth, spraying in thin spurts. Reapply top coats if necessary within the first 10 minutes, or you will likely get wrinkles in the paint. 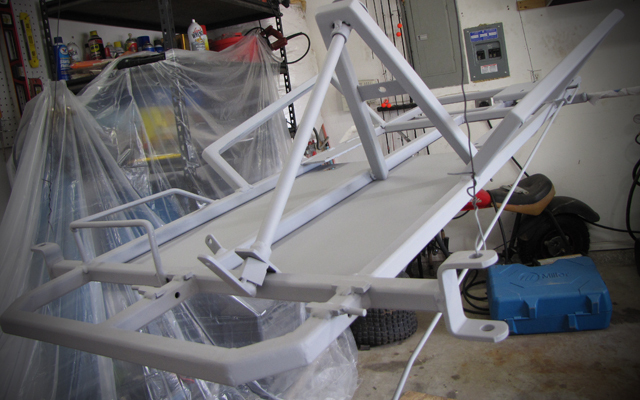 Let the paint fully cure before handling the go kart frame. If you want to use other go kart paint designs, like striping, you can use painters tape to mask off the cured top coat, then apply a secondary top coat. You can also find paint-safe vinyl decals, which you can apply a clear coat over top to protect. I just kept it simple with the paint scheme for the frame, but did a two-tone paint job for the rims. TIP: Use a heat gun between thin coats for the secondary color. Let the top coat fully cure (usually a minimum of 48 hours) before adding the second top coat. 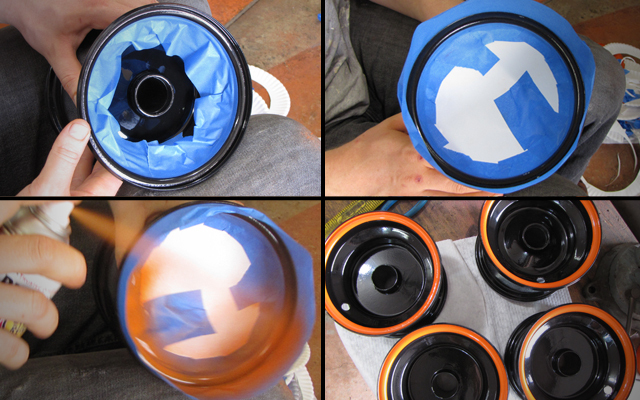 Using painters tape, mask off a circular portion of the rim. Cut out a paper plate, and tape it on the interior of the rim. Mask off the exterior portion of the rim. Apply a very very thin coat of your secondary color (the orange in this case). Use a heat gun between the secondary color coats. Applying heat for 3-5 seconds, then adding an additional coat within 10 minutes. This process will prevent wrinkling and bleed through as it flashes off more of the solvents that would get under the primary top coat. You can get away with not using a heat gun, but will need to apply very very thin coats and wait for the paint to cure between coats. You are now 95% complete. Congratulations! The only thing left to do is patiently wait at least 48 hours for the paint to cure, then assemble the go kart parts back together. Would I be able to use a spray paint gun attach to a air compressor? Hey KartFab, I just finished applying glossly paint to my go kart, and it came out looking a bit rough. I prepared the surface with sandpaper and put primer, which I also prepared with sandpaper, before I applied my paint. Would it be okay to add another coat on top of the first one to give it a smoother look? If so, would I have to prepare the surface again? Wouldn’t two or more coats cause wrinkling? I hope you can help me out. How do you paint hydraulic brake calipers and hubs, or can you even paint those. My calipers paint has completely wore off and I don’t know what kind of paint to use or anything. You can paint anything if you prep it right. Figure out what type of metal it is, then google how to paint the type of metal is is. general rule is to make sure it is super clean, rough up the surface, and apply the right paint. Is only putting general purpose paint + primer spray paint fine? Yes. Go karts get banged and scraped up. It will look nice until you drive it. Spray paint is pretty cheap too, so the cost difference isn’t that bad for premium vs generic go kart paint. Whatever you do, don’t mix types and brands of paint or you could get some wrinkles and bleed through in the paint. in the quick video i notice 5/8 bolts was being used for rear axle but what grade bolts are being used and which is best. Grade 5 or 8 are both fine to use. I used grade 8. Do you have to put primer before painting a go kart. No, but you should with most rattle can paints. Primer helps the paint stick better, and you will end up using less paint if you prime first. Paint will not flake off or chip as easily when it’s on primer. 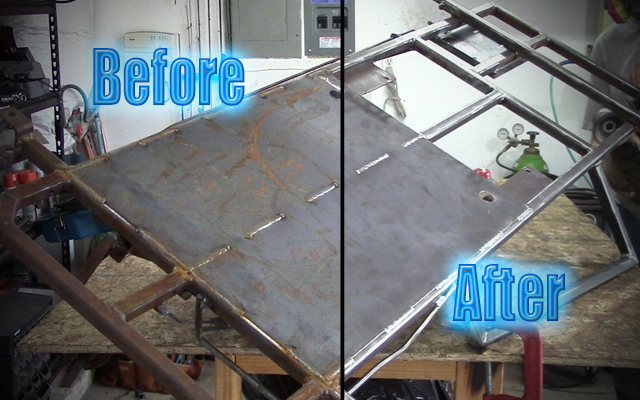 Do you always strip your karts down to bare metal before painting? What about just wet sanding to scuff up the existing paint job? I’m getting ready to repaint this kart for my girls and didn’t really want to strip it all the way down? Thank you. Yes. You can just sand with a high grit sanding block and paint over it. I use those foam blocks. 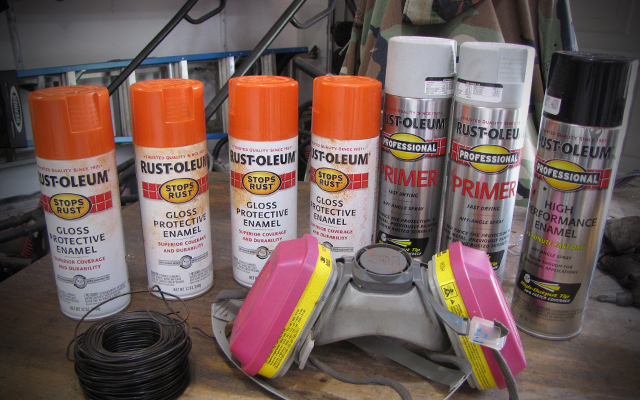 One option that really helped me when using Rustoleum spray cans is pick up a Rustoleum Comfort Grip clip-on spray trigger that goes on the top of the can. It has a built in lever you pull with a couple of fingers rather than hold the nozzle down with your finger. Helps prevent fatigue and allows more even paint application.